Construction sites are busy, bustling places of activity. Giant, powerful machines move soil and rocks and transform the land into places for us to live, work, and play. We're laying the foundation and raising I-beams over at the Wonder Job Site! How Does a Crane Work? Who Invented the Wheel and Axle? Roll up your sleeves and hammer out these building and construction Wonders! Picking things up is a snap with this simple machine. Things to pick up with your pulley! Use the hole punch to put three holes at the top/lip of the cup or bowl. Cut three short pieces of yarn all the same length. Thread the yarn through the holes, tying a knot at the bottom so it is attached to the cup or bowl. Then tie the loose ends of the three pieces of yarn together above the cup or bowl. Next cut a long piece of yarn and tie it to the three pieces you just tied together. Tape the other end of the long piece of yarn to the inside of the ribbon spool. Now wind the yarn around the ribbon spool like a yoyo. Place a band-aid or tape around each end of the pencil. This will keep the pencil from rubbing against the wood of the banister or chair. Lastly, slide the ribbon spool onto the pencil. Now it's time to use your pulley! It could be used on a stair railing or through the back of a chair with spindles. What items were easiest to pick up? What were the hardest to pick up? What happened if you moved your pulley to a different location? 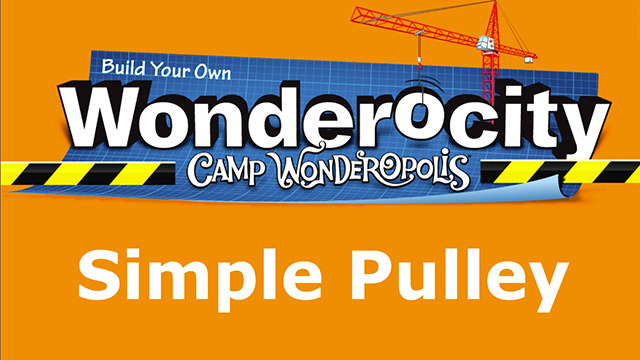 A pulley is a simple machine made of at least one wheel and a rope going through the wheel. The pulley allows you to lift items using less force. The more wheels you add, the more you are able to lift. WIth just one wheel, you don't actually save any energy. However, it is often easier to pull down to lift something than it is to pick it up. Let's Meet a Construction Worker! These reading lists were provided by Covina Public Library in Covina, California.